– All activity instruction, supervision and use of specialist equipment. – Engaging adventure activities on land and water to develop different skills. Children aged 5 & 6yrs old (at the time of the trip, ie born between 28 Oct 2012 – 25 Oct 2014) may also book on. 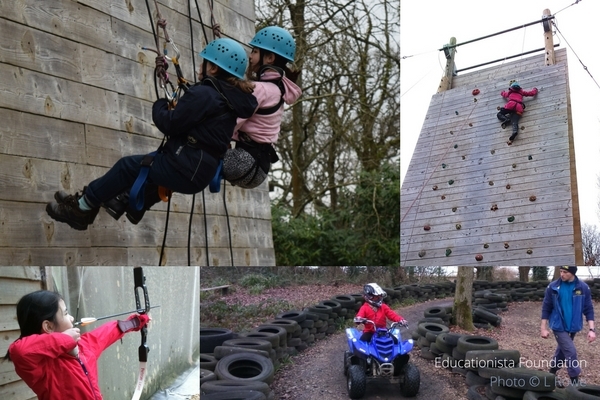 Participation in the activities for 5 & 6yr olds is at the discretion of the PGL instructor per activity as it is subject to height/build because they need to fit the harness/helmet/other equipment/etc. The PGL instructor’s decision is final. The price for 5 & 6yr olds is reduced. This trip is intended for HE families to enjoy together. . It will run along side the PGL Geography Field Trip which is taking place at the same time. All children aged 11yrs and below will need to be accompanied by a parent on this trip. We may take unaccompanied students aged 13yr+ if personally agreed in advance by either Karen or Lou. Please contact either of those two directly before booking to arrange. We would expect that to be exceptional, not least because due to adult ratios/insurance, there is a limit to how many unaccompanied under 18s that we can take overall. You are responsible for transporting your family to and from PGL Osmington Bay. If you are interested in being a responsible adult for unaccompanied children aged 13yrs+ and hold (or are willing to obtain) an enhanced DBS certificate) then please contact us. An initial deposit of £36 per person will be required by 20 February 2019. The remaining balance is required by 31st July 2019. Deposits are non-refundable unless someone is able to fill your space. For unaccompanied children there will be a £2 contribution for towards insurance. Payments need to be made by bank transfer to Educationista Foundation. Up to one carer free of charge may be allocated (at PGL’s discretion and subject to meeting PGL’s criteria) you will need to provide documentary evidence and will also need to fill in the necessary paperwork for PGL. If more than one carer space is applied for, this will be shared. For a review of our previous PGL trip, click here. Please pay via bank transfer. The bank details are in our Facebook Group. Please do not send payment without first booking on!There are two concurrent PGL trips – please use the right payment reference! If you like to attend with other families, please ask them to book themselves on. Thank you. This is an Educationista Foundation event. By booking on, you agree to adhere by the policies of the Foundation. A risk-assessment can be made available on request. There are no refunds for cancellation, curtailment or non-attendance. whether your children would be able to share with other children (and nominate the other children). There would be no adults in this room. whether you want to room together as a family. You may also share with another family – in fact, it would be really, really helpful if you could share with another family if at all possible. whether you would prefer your children to be grouped with other similarly-aged children. if your children are going to be in different groups, which parents are going with which children. We will do our best to accommodate your requests but please note that it will be subject to the room & group numbers working out mathematically. If you have any other special requirements, please put these in the “special dietary requirements” box for the relevant person. (This box will appear once you begin the booking process).